British developer Richard Gayton knows that there are quite a few personal inventory apps out there. However, his app “Sort My Stuff” puts an entirely new spin on personal inventory making it fun and, in some cases curing boredom. Gayton started developing “Sort My Stuff” because he had a problem buying duplicate offline media. He would find himself accidentally purchasing a cd, dvd, or book that he already owned. Using “Sort My Stuff” will prevent that for him, and countless others in the future. He’s also added another feature into the app which will allow you to keep track of gifts that you’ve gotten others over time. 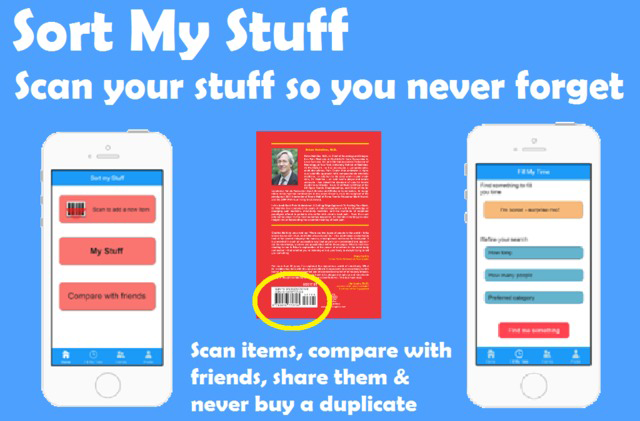 With “Sort My Stuff” you won’t accidentally by the same friend the same item again. The app lets you input your personal inventory. Then, whenever you go to a store, you can scan all the stuff you’re buying and then if you already have that item, the app will let you know, preventing duplicate purchases. Gayton also built in a time killing feature as well. If you’re looking to kill a few hours here and there with noting to do, “Sort My Stuff” will make a recommendation based on the things you already own. Finally, a compare feature allows you to compare your list of things with friends. This makes borrowing every easy or just finding something to do. It’s also a great feature for parents with kids trying to set up organized playdates. While a personal inventory app certainly isn’t life changing it seems that Gayton is on to something and offering a couple of interesting features we haven’t seen before.